As a club, the Burlington Sunrise Rotary has decided that improving childhood literacy should be a top priority. With that in mind, we have committed to fund all the free books provided by the Burlingont, VT chapter of Imagination Library. 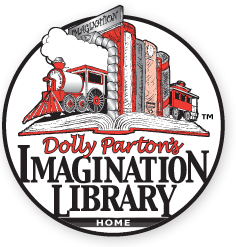 Dolly Parton (yes, that Dolly Parton) started Imagination Library back in 1995 in Tennessee. By 2000, Dolly expanded the vision into a replicable model nation-wide. Anyone willing to partner with IL and support it locally would receive her help. By 2013, the Library had over 1,600 affiliates. Since '96, the Library has registered over 1 MILLION kids for free books, including many in the Burlington, VT area. The program now delivers over 1 MILLION FREE BOOKS EVERY MONTH to kids in the USA, Canada, United Kingdom and Australia. You can help! Donate funds to Imagination Library Burlington by clicking on the following link and adding "Burlington, VT" to the field that says "If you want this donation to be directed to a local affiliate please specify which affiliate:" . Click here to donate. Another way to donate is to visit our South Burlington Barnes & Noble (102 Dorset St.) on July 21st, 2018. We'll be conducting an Imagination Library Bookfair! From all items purchased during the fair, using a voucher available at the Rotary table, a percentage of sales will go directly to Burlington's Imagination Library chapter. Click here to learn more about the bookfair. Dolly's vision was to foster a love of reading among her county’s preschool children and their families by providing them with the gift of a specially selected book each month. By mailing high quality, age-appropriate books directly to their homes, she wanted children to be excited about books and to feel the magic that books can create. Moreover, she could ensure that every child would have books, regardless of their family’s income. Parents in Burlington can register their kids for free books by clicking here. Or click there to learn how you can register via the mail. Burlington's Imagination Library receives the largest portion of all funds raised by the Burlington Sunrise Rotary. You can donate to Dolly's Imagination Library by clicking here. And remember to specify "Burlington, VT" as your local affiliate.